MainAll NewsForeign Affairs"Amnesty is hiding its anti-Semitism under cloak of 'ideology'"
"Amnesty is hiding its anti-Semitism under cloak of 'ideology'"
Settler leaders accuse Amnesty International of attempting to erase Jewish history, compares group to ISIS. Israeli settler leaders lashed out against Amnesty International Wednesday morning, following reports that the self-described human rights monitor and advocacy group is preparing a campaign to discourage tourism to Jewish sites in Judea, Samaria, and eastern Jerusalem. On Tuesday, the NGO Monitor watchdog group revealed that Amnesty International is set to release a report calling for a boycott of Jewish sites and communities outside of the pre-1967 Green Line in not only Judea and Samaria, but also eastern Jerusalem. Amnesty International’s report makes no reference to the Jewish connections to sites including the Jewish Quarter of the Old City of Jerusalem, the Western Wall, or the Temple Mount – describing them as “occupied” territory. The report claims that tourism at these sites helps support “the occupation” and is an attempt to erase the Palestinians' historical ties to the area. The campaign specifically calls for Airbnb, booking.com, Expedia and TripAdvisor to boycott these tourist sites, which are located in Judea and Samaria, Jerusalem and the Dead Sea, and also calls on countries where these websites operate to legislate laws restricting their activities vis-à-vis tourism sites to which Israel is trying to link itself historically. Yochai Damari, chief of the Mount Hevron Regional Council in Judea, excoriated Amnesty over what he called an “anti-Semitic” campaign to erase Jewish history in the region. 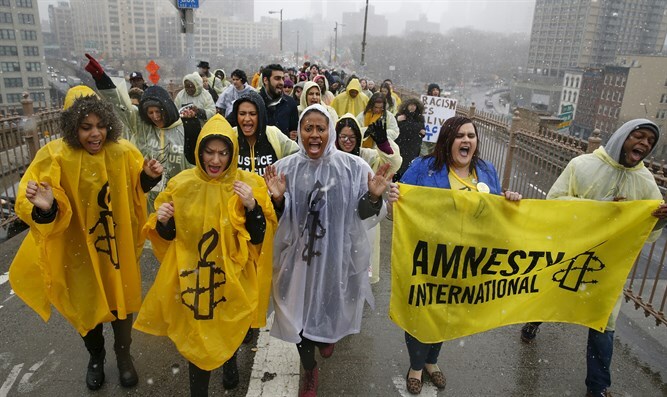 “Amnesty’s activities is the latest in a long chain of anti-Semitic activities masquerading as ideology which attempt to undermine the legitimacy of Israel and the settlement enterprise in Judea and Samaria and even in Jerusalem. “[Amnesty’s] activities try to undermine the simple historical fact that the Land of Israel belongs to the Jewish people historically, morally, and even archeologically. The Palestinians and their European supporters are frustrated by the fact that they haven’t found even a single archeological site linking the Palestinians to the Land of Israel, even as Judea and Samaria is filled with [archeological] finds going back 3,000 years to the Biblical period.